Breuer, William B. 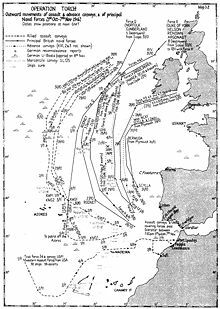 Operation Torch: The Allied Gamble to Invade North Africa. New York: St.Martins Press. 1985. Danan, Professeur Yves Maxime. La vie politique à Alger de 1940 à 1944. Paris: L.G.D.J. 1963 （法语）. Funk, Arthur L. The politics of Torch. University Press of Kansas. 1974. Howe, George F. North West Africa: Seizing the initiative in the West. CMH Online bookshelves. Washington: US Army Center of Military History. 1991 . CMH Pub 6-1. Levisse-Touzé, Christine. L'Afrique du Nord dans la guerre, 1939-1945. Paris: Albin Michel. 1998 （法语）. Meyer, Leo J. Chapter 7: The Decision To Invade North Africa (TORCH). (编) Greenfield, Kent Roberts. Command Decisions. CMH Online bookshelves. Washington: US Army Center of Military History. 2000 . CMH Pub 72-7. Michel, Henri. Darlan. Paris: Hachette. 1993. Moses, Sam. At All Costs; How a Crippled Ship and Two American Merchant Mariners Turned the Tide of World War II. Random House. Nov 2006.